This page documents the ongoing development effort to develop a XML version of TMATS. The current 106-15 schema that has been published by the RCC, is found here: Tmats Schemas.. Here is a sample TMATS file. Here is the equivalent XML file. Generic "length" element removed. Tagged Data Length element removed (TD1). ModuleType and RMMType combined to use one global complex type. Removed "CoefficientsEntryType" as it was only used in one place. Changed NegativePowersOfX to "CoefficientsType" Removed the unused "NegativePowersOfXType" definition. Tmats B-Group schema has been restructured to match our concept of globalizing as much as possible. Imports in each file have been altered, so that each individual file will validate on its own. All Imports removed from each of the separate schemas. Now, only Tmats.xsd imports the other schemas. For PCM Measurements: The path "PcmMeasurements \ MeasurementList \ Measurement \ WordAndFrame \ MeasurementLocation \ MeasurementFragments \ ..." has been changed. The attribute from "MeasurementFragments" has been removed, and turned into a subordinate element, called "FragmentTransferOrder". A new subordinate element called "FragmentPosition" has been created. For Tagged Data definitions: The path "PcmMeasurements \ MeasurementList \ Measurement \ TaggedData \ ..." has been changed. A new element, called "FragmentPosition" has been created. Discussion item: With this new concept, it would be possible to have two different definitions for the same fragment. I don't believe this is the intent! Global data types have been created, for all TMATS elements, that are not part of the standard XML data types. If a data type was anything other than an "xs:" datatype, a global was created. I fixed a bug in the schema. In the "D Group" area, the <IDCounterName> element was in the wrong place. A new <WordAndFrame> element has been created, and the IDCounter element was placed subordinate to it. "RecordingEventDefinitions/RecordingEvent/Measurement" element name changed to "RecordingEventDefinitions/RecordingEvent/TriggerMeasurement"
ID Counter element "InitialSubframeNumber" name changed to "InitialMinorFrameNumber"
ID Counter element "EndSubframeNumber" name changed to "EndMinorFrameNumber"
Restriction removed from AsyncEmbeddedFormat element. It can now contain an unlimited number of definitions. Async format TMATS commands AEF7, AEF8, AEF9, AEF10 added. S Group: The "Message" element is located in the wrong area. It was moved, so that it is subordinate to the "Stream" element. <MeasurementName> element, in the B-Section definition that appears in the PCM Format area, changed to allow a string value. Previously, and by accident, this element did not allow a string value. R Group: Individual channel related "Data link" elements removed (PDLN and BDLN). "BusDataTypeAttributes" element no longer needed. New "ChannelDataLinkName" element added. B Group: Changed Sub Terminal Addresss elements, to allow a string made up of 0's, 1's or X's. Added new "Measurement Type" and "User Defined Data" elements. C Group: Added "Bit Weight" binary format. Added new "Bit Weight" related fields. Added "Negative Powers of X" data conversion type, and related elements. Namespace changed to static value that will not change with new versions. The URL http://www.spiraltechinc.com/tmats/XMLSchema/ was created. This web page simply redirects the user back to http://www.spiraltechinc.com/tmats/ (to match the URLs listed in the actual schema). Multiplex Element: Removed "SCO\N" (NumberOfSubCarriers) element. This was not needed. Changed "Other" subcarrier element, to be unbounded, allowing for an infinite number of element definition. Multiplex Element: Added "DataConversion" element above Comment element, to allow for FM link EU conversion definitions. DataLink Element: Re-titled DataConversion element. This is now the one and only place EU conversions (excluding FM links) will be defined. All other DataConversion definitions found throughout the schema have been removed. PCM Format/Bus element: ParityTransferOrder (MN2) element removed from schema. (8/23/2006) PCMFormatAttributes Bus attribute definition changed to allow for up to 16 bus definitions (was previously unbounded to infinity). (8/23/2006) DataLink Bus attribute definition changed to allow for an infinite number of bus definitions (previously only allowed 1 definition). (For help on understanding what this documentation shows, view this help file). Removed the "TmatsDate" and "TmatsDateTime" data types from the schema. These, defined date and time fields in existing TMATS syntax. It was decided to use the native XML types for date and time fields (xs:date and xs:dateTime). All elements that previously referenced the "TmatsDate" and "TmatsDateTime" data types, have been changed, to reference the native XML date and time formats. Removed the "TmatsString" data type from the schema. This data type was used for most string type fields. It prevented a string from containing a semi-colon, which is not allowed in the original TMATS format. This restriction is not needed in XML, but was originally incorporated to make the XML version of TMATS behave like the original TMATS format. All references to "TmatsString", were replaced with the native "xs:string" type. Removed all references to "Spiral Technology" from the comment fields at the beginning of the schema. The definition of the <Name> element for defining measurements (in the S section) was changed to allow it to contain "data" and subordinate elements. Previously, the definition would only allow this element to contain subordinate elements. This change allows this element to also contain the actual name of the measurement, in addition to the subordinate elements. The <Location>, <Wordlength> and <Mask> elements for defining an Async Embedded Format (in the P section) were changed to be "unbounded". This allows more than one occurrence of these elements to be defined, which allows an async stream to be defined using the "every location" method. The <Location> element for defining a Async Data Merge Formats (in the P section) was changed to be "unbounded". This allows more than one occurrence of this element to be defined, which allows an async data merge format to be defined using the "every location" method. The "comment" for the <IDCounter> element in the P group was removed. The comment field indicated that this element was derived from the ISF1 and ISF2 TMATS commands, which is no longer accurate. The whole "ChannelAssignment" element, and its subordinates needS to be looked at, in the PAM Attributes area. The TMATS definitions here, are very hard to understand. We need to confirm that the way the DataConversionAttributes sections are being used, is what we really want. Based upon a previous suggest from another person, the B section appears twice in the schema. We need to confirm that this is what we really need, and we need to document when one definition should be used over the other. NOTE: This is the version submitted to the RCC for Pink Sheet review. Removed the <NumberOfSubCarriers> element from the MultiplexModulationGroupType definition. These "Number Of" commands are not really needed in the schema. Added "Name" Attribute to <DataLink> element, which appears subordinate to the <DataSource> element. The <DataLink> element, is intended to be the "starting point" for all data link related information, so the data link name attribute belonged here. Removed the "DataLink" attribute from the <PCMFormatAttributesType> element definition. This attribute was not needed here, because the <PCMFormatAttributesType> is subordinate to the <DataLink> element, which contains the name. Changed the way the <AsyncEmbeddedFormat> element referred to another Data Link. Previously, this element would "recursively" call another <PCMFormatAttributesType> structure. This reference was removed, and a new <DataLinkName> element was added (The AEF\DLN command). This element would be used to refer back to another <DataLink> element structure. Removed "Attributes" from various elements of the two 1553 (B Section) definitions, and replaced them with element definitions. Comment received from Joachim Achtzehnter of NetAcquire: "The VendorSpecificAttributes element is presumably intended to contain vendor-specific information, but the current Schema does not permit any contents for this element." Response: This same problem exists with the current H Group element in the schema. Joachim was correct in stating that the schema prohibited the V and H section elements from being able to accept any subordinate elements or data. Joachim gave me the correct code, to allow these elements to accept any subordinate content. The content of these two elements, remains undefined (as it does in TMATS), but at least the schema will allow subordinate data in these elements. Comment received from Joachim Achtzehnter of NetAcquire: "What is the rationale behind the namespace declarations in the Schema file? More specifically, why is there a reference to a Microsoft xml-msdata Schema even though this does not appear to be needed? What is the purpose of the targetNamespace pointing to itself? " Response: The reference to the Microsoft Schema was removed. Response: Good catch! This was a typo. "MSB FIrst" has been changed to "MSB First". In the PCM measurement list, where measurement word and frame locations are specified, I made the StartFrame element mandatory, instead of optional. Removed the "DataSource" attribute from the MultiplexModulationGroup element. DataSource is not needed, since the MultiplexModulationGroup element is subordinate to the DataSource element. Place all global data type definitions in their own schema. Do we need to discuss this, or is this a good idea? Break up TMATS into separate (smaller) schemas. Do we need to discuss this, or is this a good idea? How should it be broken up? Data Conversion information, is stored for each measurement, subordinate to the PCM format, or Bus structure, the measurement is defined in. This allows measurements having the same name to be defined with different EU values (which is something TMATS can not support). The ramification of this, is that if someone wants to globally "change" an attribute, common to the EU definition for a particular measurement, those changes must occur in each Data Conversion definition throughout the entire XML file (not just in one place). Is this a problem? The Mux/Mod section was moved to the same level as the Tape and RF sections. Previously, it was subordinate to those sections. This change means that a Mux/Mod definition can exist without a matching RF or TAPE definition. Baseband Datalink element was moved out of the Mux/Mod group, and placed at the same level as the Tape, RF, and Mux/Mod element, allowing a Datalink to be defined without corresponding Mud/Mod definitions. Duplicated 'B' section to the same level as the current 'P' section. Convert other common "selection" type TMATS fields (those commands that have the same values, such as the various "parity" fields), to global data types, instead of enumerating them each time. Modify the two 'B' section definitions. The 'B' section subordinate to the 'P' section, only needs to have basic measurement information (not bus information). Its unclear, whether or not the 'B' definition that is at the same level as the 'P' section needs to contain everything (bus/message/measurement definitions), or only bus/message definitions. 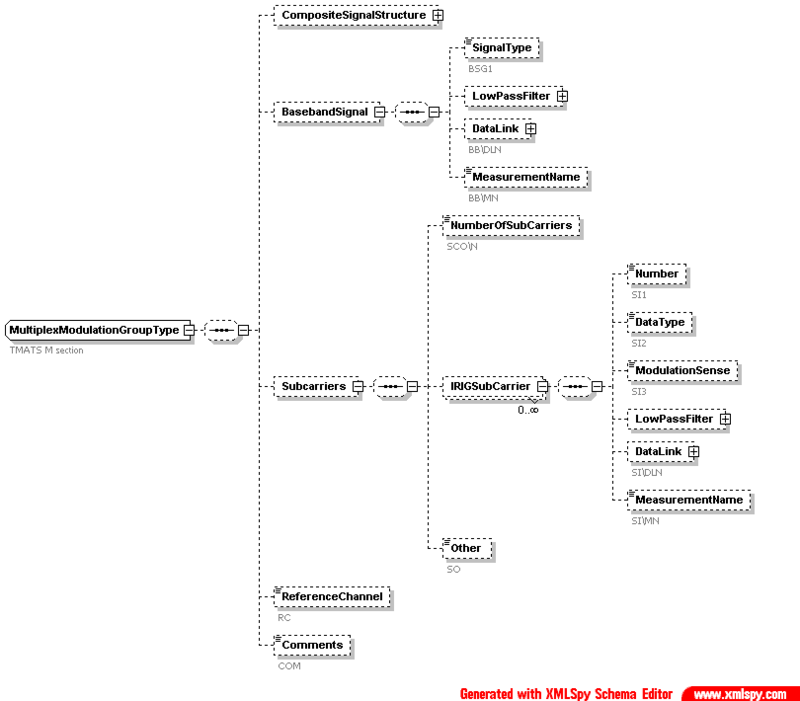 This schema was written to the 106-04 Specification, and follows the basic hierarchy found in Figure 9-1 of IRIG 106-04. Yes, this is basically a "XML version of TMATS". 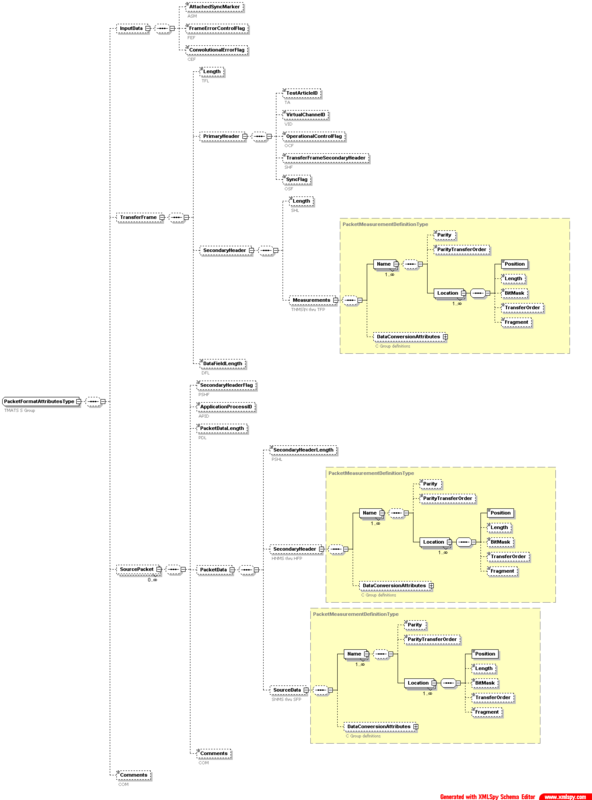 The commands, and fields that exist in TMATS are all defined in this schema. It was determined that the "P" section subframe definitions were no longer needed. They are not included in this schema. PCM Measurements are defined using one method only. The numerous "methods" for describing measurement locations from the "D" section of TMATS, are replaced with the one method that appears in this schema.